If you see downed power lines, always assume they are dangerous and stay away! UCEMC is committed to providing our members with reliable electric service. However, storms, accidents, animals or construction-related incidents can cause a power outage in your area. When that happens, we’ll mobilize crews to get your service safely restored as quickly as possible. If your power goes out, check to see if your neighbors have power. If your home is the only one without power, check your circuit breakers or fuses to determine if the outage is the result of a household problem. Please click on your local UCEMC district office below to contact us if you determine that the outage is not the result of a household problem. Maintenance: We work year-round to inspect and maintain our electric delivery system of 12 substations and more than 5,000 miles of power lines. 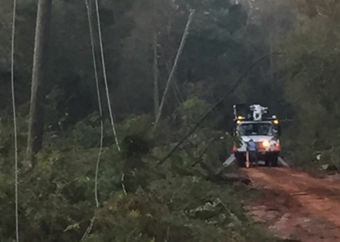 Tree Trimming: Trees close to power lines are a major cause of outages for members. That’s why keeping trees trimmed to prevent outages caused by fallen limbs is very important to us. Keeping animals out: Animals like squirrels and raccoons can damage electrical equipment. We install animal guards on equipment where animals are likely to cause problems. UCEMC schedules power outages from time to time for our crews to do critical maintenance to substations and power lines. We understand there is never a convenient time for the power to be out, but by performing these routine outages with some advance planning, our system can be better prepared to handle extreme weather and other variables – the times when you count on electricity the most.